WASHINGTON, D.C. (Sept. 14, 2009) — Congressman Ike Skelton (D-Mo.) announced that the U.S. Department of Justice will release more than $288,000 to the Pulaski County Jail to develop five new correctional officer positions. These funds will be made available by the American Recovery and Reinvestment Act (ARRA) and will be distributed through the Bureau of Justice Assistance office. “I commend the Pulaski County Jail in Waynesville for being awarded funding from the Recovery Act. This funding will create new jobs in rural America and will allow the agency to implement new programs to address the medical and emotional needs of addiction-related inmates,” said Skelton. The Bureau of Justice Assistance office provides financial support to rural states and rural law enforcement agencies to prevent and combat crime, especially drug-related crime, train law enforcement officers, and improve detention and jail operations. 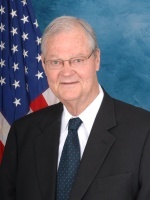 Congressman Ike Skelton (D-Mo.) serves as chairman of the House Armed Services Committee. Congressman Skelton’s website is at http://www.house.gov/skelton.